This outraged CAIR officials, who immediately began efforts to get their organization removed from the list. They found a powerful ally in Secretary of State John Kerry, who authorized State Department officials to meet regularly with UAE officials to lobby on behalf of CAIR and MAS. At a daily State Department press briefing two days after UAE released its list, a spokesman said that State does not "consider CAIR or MAS to be terrorist groups" but that it was seeking more information from UAE about their decision. He added that "as part of our routine engagement with a broad spectrum of faith based organizations, a range of U.S. government officials have met with officials of CAIR and MAS. We at the State Department regularly meet with a wide range of faith based groups to hear their views even if some of their views expressed at times are controversial." In making that admission, the State Department official had effectively affirmed the Obama Administration policy of embracing radical Islamist groups under the euphemism of calling them "faith based groups." The UAE had good reason to designate CAIR, as records obtained by the FBI indicate it was created as a front group for a Hamas support network. While CAIR bills itself as "the nation's largest Muslim civil rights and advocacy organization," the reality is quite different. Before helping launch CAIR, Executive Director Nihad Awad worked as public relations director for the Islamic Association for Palestine (IAP), a Hamas propaganda arm in the United States. A 2001 Immigration and Naturalization Service memo documented IAP's support for Hamas and found that the "facts strongly suggest" that IAP was "part of Hamas' propaganda apparatus." IAP was part of the "Palestine Committee," created by the Muslim Brotherhood to support Hamas politically and financially. CAIR was added to the Palestine Committee's roster just after its 1994 creation. In a letter to U.S. Sen. Jon Kyl, the FBI explained, "until we [the FBI] can resolve whether there continues to be a connection between CAIR or its executives and HAMAS, the FBI does not view CAIR as an appropriate liaison partner." During a 2003 Senate hearing, U.S. Sen. Charles Schumer, D-NY, said that CAIR is known "to have ties to terrorism." In 2009 correspondence with the FBI, he wrote that cutting off contact with the Islamist group "should be government-wide policy." CAIR and its representatives, meanwhile, often espouse radical ideology and propagate the jihadist narrative that the United States is waging a "war on Islam." Awad repeated that message as recently as September when he denounced legislation allowing the families of 9/11 victims to sue Saudi Arabia. CAIR-New York board member Lamis Deek, an attorney, tweeted during the 2012 war between Israel and Hamas that Gaza is a "beacon of resistance, exposes shackles, awakens dignity, inspires revolution, reaffirms our oneness – the reason 'israel' won't last." Just days before the UAE's 2014 designation of CAIR as a terrorist group in the organization's San Francisco chapter bestowed its "Promoting Justice" award to Sami Al-Arian and his family. Al-Arian secretly ran an American support network for the Palestinian Islamic Jihad (PIJ) terrorist group in the late 1980s and early 1990s. PIJ was responsible for terrorist attacks which killed dozens of Israelis and several Americans. Al-Arian pleaded guilty to conspiring to provide goods or services to the PIJ. His plea agreement included an admission that he was associated with the PIJ. U.S District Judge James S. Moody went further in sentencing Al Arian: "The evidence was clear in this case that you were a leader of the Palestinian Islamic Jihad," Moody said. "You were on the board of directors and an officer, the secretary. Directors control the actions of an organization, even the PIJ; and you were an active leader." In December 2014, CAIR met with top officials of the State Department, the Department of Homeland Security, and the Justice Department, asking them to pressure the UAE to remove them from the list, according to reliable sources intimately familiar with the communications. On December 22, 2014, CAIR issued a press release asserting that "the two American Muslim organizations and the U.S. government pledged to work together to achieve a positive solution to the UAE designations." In response to a letter sent by CAIR Executive Director Nihad Awad sent to Secretary Kerry protesting the UAE designation, Kerry responded on May 5, 2015 in a letter to Awad stating, "Let me reiterate, first, that the U.S. government clearly does not consider CAIR to be a terrorist organization. As your letter noted, the Department of State rejected this allegation immediately after the UAE designations were announced in November, and we will continue to do so....U.S. officials have raised the issue of CAIR's inclusion on the UAE's terror list with UAE officials on multiple occasions..."
That portion of the letter now appears on CAIR's website. But at the time that the letter was sent to CAIR, according to knowledgeable sources, there was an agreement between CAIR and the State Department to keep the letter secret. An excerpt from it was posted on CAIR's website only in May 2016, a year after it was received. The IPT has learned that Kerry and CAIR made this agreement to keep the letter secret so as to protect Kerry from public embarrassment. In light of CAIR's numerous ties to Hamas and other unsavory aspects of its record, Kerry had good reason to believe that the letter could cause a public relations disaster for him. Whatever influence the State Department exerted on the UAE did not work. 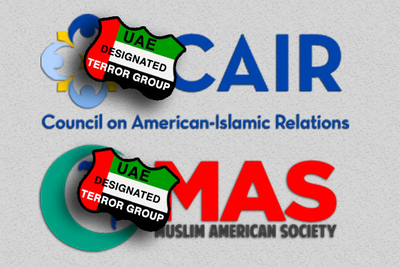 There has been no indication CAIR and MAS were removed from the Gulf state's terrorist list. When the UAE list was published, CAIR realized that it was going to a public relations disaster for them as well. So they published a FAQ attacking the UAE as a "politically 'authoritarian' regime." The organization seemed more comfortable with this authoritarian regime in 2006, when Awad and CAIR spokesman Ibrahim Hooper led a delegation on a fundraising trip to the UAE. State Department cables show that the delegation, led by the public relations firm Hill and Knowlton, sought millions of dollars from UAE donors. The cables, obtained by the IPT through the Freedom of Information Act, show that CAIR officials met with top UAE leaders and attended an evening reception "in honor of the CAIR group" hosted by a top presidential adviser. The cable also noted that "UAE press has reported that Sheikh Hamdan bin Rashid al-Makhtoum Deputy Ruler of Dubai and UAE Minister of Finance and Industry, 'has endorsed a proposal to build a property in the U.S. to serve as an endowment for CAIR.'" The cable added that CAIR had already received substantial contributions from several wealthy UAE donors, including one who had already given CAIR $1 million. The Muslim American Society, meanwhile, has its own lengthy record of defending accused terrorists and terror supporters. It was formed as the Muslim Brotherhood's overt arm in the United States. Co-founder Abdurrahman Alamoudi, who pleaded guilty in 2004 to engaging in illegal transactions with Libya and facilitating a Libyan plot to assassinate then-Saudi Crown Prince Abdullah, testified in 2012 that MAS's connection with the Brotherhood cannot be disputed. This sordid episode of going to bat for a Hamas-support organization is emblematic of the larger problem of the Obama's administration's inability to pinpoint the heart of the impasse between the Palestinians and the Israelis as unceasing Palestinian terrorism, continued Palestinian subsidies paid to terrorist families, incendiary glorification of terrorists who kill Jews, and massive anti-Semitic incitement in Palestinian schools and media.